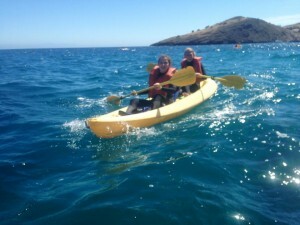 Mountain and Sea Adventure’s summer camp on Catalina Island provides youth with the unique opportunity to try new things, push themselves to the boundaries of their comfort zones, break their fears, develop social skills and play in the great outdoors in the sun and water. Apart from giving them the best summer break ever, the experiences your child will have at shipboard camp on Catalina will improve their social skills, self-confidence and overall belief in themselves. 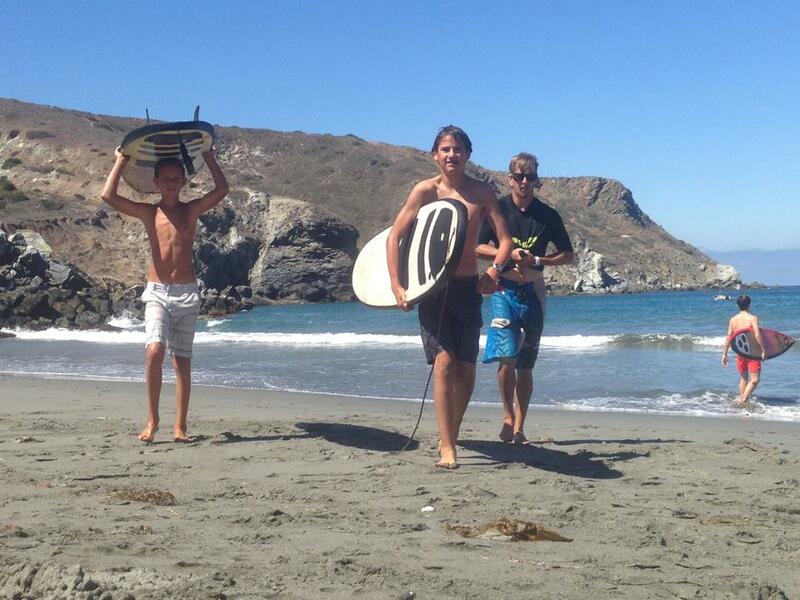 Coming to camp on Catalina Island gives youth endless opportunities to experience a wide array of activities. 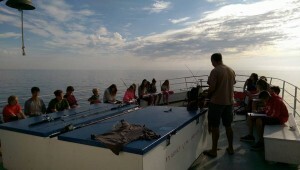 From snorkeling to cliff jumping, squid dissection, handling invertebrates and other sea animals, and living away from home on a marine research vessel off the coast of Catalina Island – the camp experience gives each child the chance to go to the limit of their comfort zones, and discover the excitement which lies beyond. 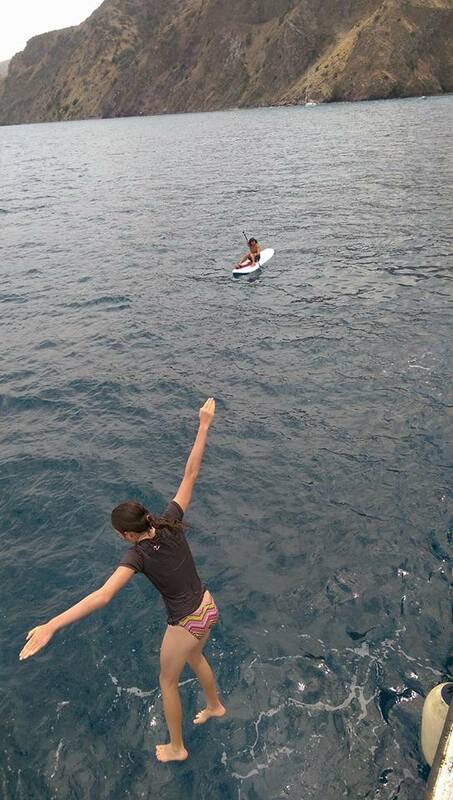 Every child has something to gain from the adventurous camp experiences at MSA’s shipboard summer camp program. Our theme at camp is ‘break your fears’, and we are passionate about structuring healthy opportunities for each camper to face their fears and develop the courage to go beyond what they previously thought was possible for themselves. With a jam-packed schedule of games, sports, skill sessions and activities both in and on the water – the campers quickly learn teamwork and form tight bonds and friendships, which often last a lifetime. From the very first icebreaker activities upon arrival, the campers learn to interact and enjoy sharing time together without a smart phone or computer screen between each other. Enjoying the great outdoors together and playing in the sun and water allows each camper the chance to drop their walls and just be kids playing together. Without all their usual distractions from home, each camper is the only entertainment they all have. This allows the children the opportunity to display their personality, sense of humor, and other character traits. Each child enriches the camp experience for all the others. The challenges children face at camp structure the opportunity for them to learn teamwork, and to discover that they can achieve more when they work together. When all the campers are cheering each other on to rise above their fears and challenges, it boosts the overall morale and attitude of each participant. To hear their peers cheering them on gives each child an incredible amount of encouragement to rise above their inhibitions and achieve things they might have never thought they could before. This helps to improve their overall self-image and belief in what they are capable of, even discovering strengths and talents they never knew they had before. The MSA staff is passionate about uplifting the spirits of youth and speaking inner strength and encouragement into their lives. The first step is to face their fears, just this is a huge victory – for then their fears and inhibitions are not ruling them any longer. The camp counselors are all first aid and lifeguard certified, and are always there to assure the campers that they are safe to explore, broaden their horizons and try new things. Your child is guaranteed to come home from their week of summer camp with a strong sense of self, confidence in their traits and talents, and higher self-esteem. Mountain and Sea Adventures summer camp program on Santa Catalina Island enriches the lives of youth by giving them valuable positive memories, teaching them life skills, imparting strong character traits and improving their self image and overall confidence levels. 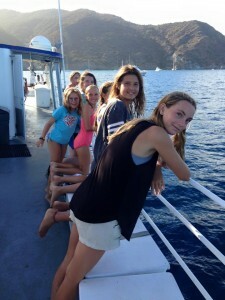 Catalina Island Summer Camp – The Adventure Of A Lifetime! There is no better opportunity to enjoy your summer holiday and experience all that Catalina Island has to offer than with MSA’s shipboard summer camp. From cliff-jumping, snorkeling at world famous dive spots, kayaking, paddleboarding, surfing, hands-on marine science research and so much more – a week aboard the Wilderness Explorer will impart high self-esteem, inspire your child to discover their limitless potential and give them memories that will uplift them and enrich their lives. One of our campers all time favorite things to do is to go up to the top deck and jump in the water, falling about 20 feet through the air and splashing into the water below. This is a real Adrenalin rush, but is completely safe. With lifeguards on the top deck next to where they are jumping, and lifeguards in the water – the kids know they are well protected. This activity gives our campers an awesome opportunity to face their fears and step out of their comfort zones. 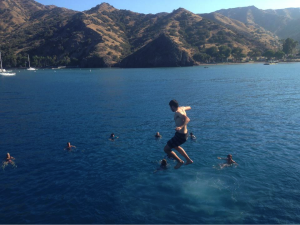 Once the campers have gotten comfortable leaping off the top deck of the ship, they get a chance to cliff jump at Little Harbor, this is a little higher (about 30 feet) and seems more of a challenge. Again, we have multiple lifeguards at the top and bottom of the jump to be sure the kids feel safe. This is always a favorite activity for the campers, and leaves them feeling like they have broken their fears and inhibitions. The Wilderness Explorer has many different floating water toys for campers to play in the water with. 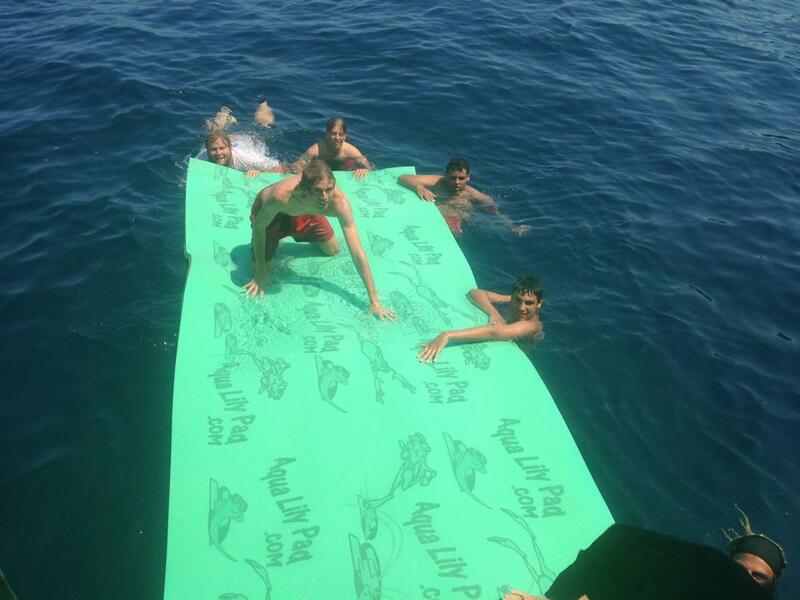 We have a large floating raft that the kids can relax on and play with each other on, as well as many tubes for floating, drifting and sunbathing. We go from cove to cove exploring sea caves, famous dive locations, beautiful sandy beaches and other island attractions allowing the campers to enjoy a wide variety of water based activities. We can see all that the island has to offer with small zodiac skiffs, kayaks and paddleboards. Whether if the kids want to go for an intense half day kayaking safari, play on the skiff, or just paddle around on the kayaks and paddleboards – they can enjoy island life at their own leisure. 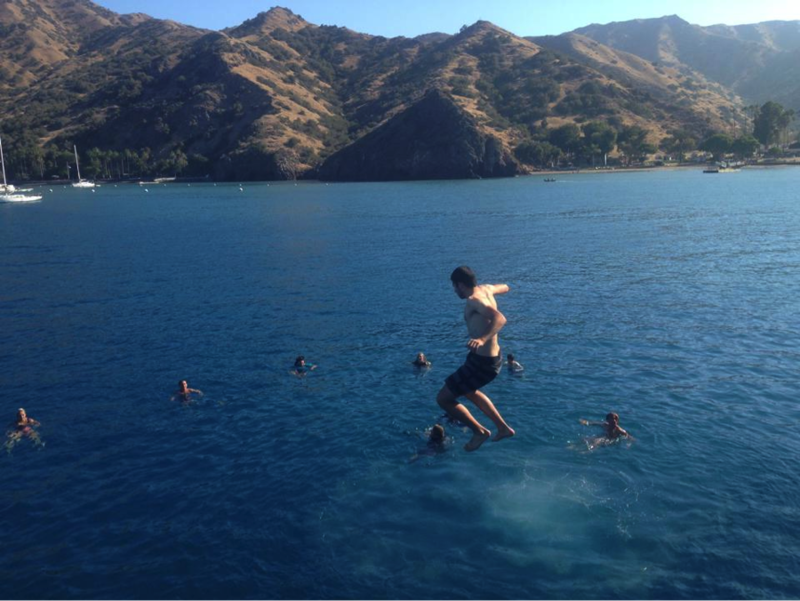 Catalina Island is home to some of the best snorkeling locations in the world. From Italian Gardens to Emerald Bay, these are highly sought after places mentioned in international travel magazines due to their wide diversity of marine life. Campers get the chance to see Garibaldi, kelp bass, sheepshead, leopard sharks, bat rays, seals and sea lions, dolphins and often times even whales. On rare occasion even sea turtles, Rizzo’s dolphins and orca have been spotted off the coast of the island. 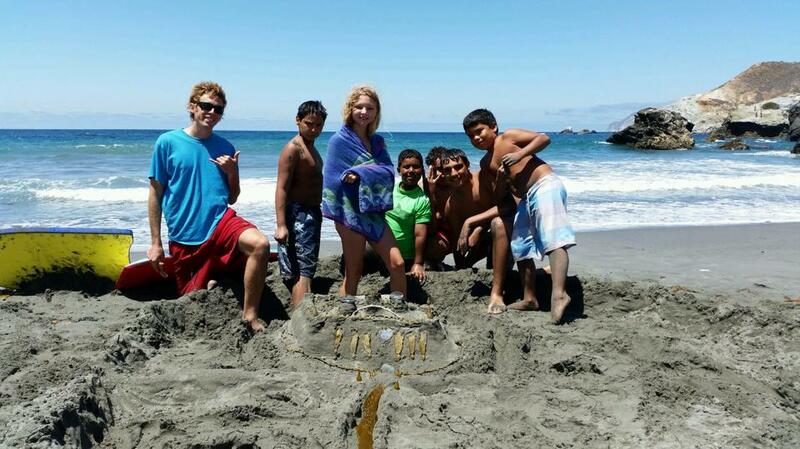 When you have this much fun together, the friends you meet during Catalina Island summer camp often become friends for life. Not only are the experiences made during camp treasured memories, but the kids come together as a strong family-like unit to encourage each other to step outside of their comfort zones, dream big and break their fears. There is really nothing like such an adventurous and fun summer camp to empower your child to discover their hidden potential, build high self-esteem, and develop the courage to reach for the stars. Many of our attendees discover a deep personal love for the marine environment and the world of natural science after their week aboard a marine research vessel. We do plankton trawls and water sampling, allowing students to look under microscopes and see what the difference is for zooplankton and phytoplankton with their own eyes. This is an extremely valuable opportunity to discover how much fun learning really is, and often ignites a passion for science. This makes the world of science real living breathing hands-on life, not just book based theory. This is where scientists are born! The kids who go to summer camp on Catalina Island return home with a profound new appreciation for environmental science, and often begin planning their majors and careers. 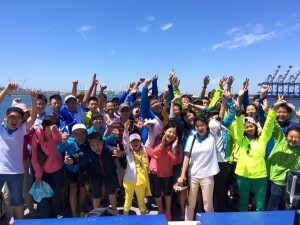 There is truly nothing like a week at ship aboard Catalina Island summer camp to impart courage, inspire your child to dream big, help them to see their own greatness and limitless potential, and encourage them to dream big and shoot for the stars!